A Canadian woman's first act upon winning the lottery was to threaten to sue her nephew for his half of the C$1.2m ($912,000; £690,000) win. "See you in court," Barbara Reddick told Tyrone MacInnis as they both posed with the giant novelty cheque in Nova Scotia province. Both their names were on the winning ticket from Wednesday night's "Chase the Ace" draw. But Ms Reddick claims she never promised to split the jackpot with him. "I'm taking him to court," she told those gathered at the winners' ceremony on Thursday in Margaree Forks, a small community of about 3,400 people, according to the CBC. "I'm getting a lawyer tomorrow." She denied the two had had an agreement. But her nephew told reporters: "Yes, we did." Ms Reddick said: "He's lying." She said she just put her nephew's name on the ticket for luck "because he's like a son to me - he was". Ms Reddick told reporters she only promised to share possible winnings from a smaller draw, not the jackpot. "He was lucky, but not for half a million dollars," she said. 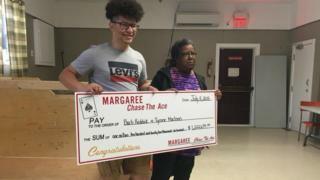 Bernice Curley, chairwoman of the Margaree Forks Chase the Ace committee, said she was taken aback by the family feud. "I'm a little bit disappointed that happened at the end," she told CBC. Chase the Ace is a lottery game popular all over Canada's east coast, and often raises money for charity, in this instance for the regional fire services. Ms Reddick's mind had not changed by Friday, when she told the Canadian Press that her nephew does not deserve the money. She maintained the pair had no prior discussion about splitting the win, and that she recently bought him a car and had been helping him pay for college. But the provincial agency that oversees lottery and gambling suggested there was little Ms Reddick could do. In a statement to the BBC, the agency said it is not uncommon for more than one name to be listed on a ticket in these kinds of lotteries. "In these instances, we expect the licensee to split the prize equally amongst those named on the winning ticket," it stated. "From our perspective, the prize has been awarded and the lottery is concluded."